The view from the top was breath-taking. From an altitude of 384 meters, you can see quite some distance. The city of Taipei law beneath me, covering large areas of land. In most directions the urban sprawl went on for as long you could see, to one side forest-covered mountains lay not far away. It was a bit cloudy, the view was partially blocked from clouds and smog in the distance. I had been in Taipei less than 24 hours, did not know the city, but with the help of a map I figured out where I was staying in relation to the tower. I looked and looked. I never managed to spot my building. This entry was posted in Taiwan and tagged food, sightseeing, Taipei, view on October 27, 2016 by Traveltorgeir. I never had time to visit all the places in Taipei they recommended me to go, but the ones I did go to did not disappoint. You only had to ask and they would start writing down places to go. Restaurants, hot springs, night clubs, cool sights. The owners at Funky Fresh were some of the nicest people I met in Taiwan, which was the main reason I kept coming back. This entry was posted in Taiwan and tagged bar, beer, Taipei on October 24, 2016 by Traveltorgeir. As I arrived at the airport it was just after midnight. I took the escalator up from the platform, left the train station and headed towards Terminal 2. The train had been almost empty the whole way from Keisei Ueno Station in Tokyo. The airport was almost deserted. A few other passengers were here, almost more security guards and police officers. It was still just over eight hours until my flight left, I was going to spend the night at the airport. This entry was posted in Japan and tagged airport, hotel, Narita, tokyo on October 20, 2016 by Traveltorgeir. Just lying there, all relaxed, not a worry in the world, the 42°C water encompassing you, was so relaxing. Just what my sore muscles needed. After a long day of skiing, having a bath in the onsen at the Hilton Hotel was perfect. We were cold after hours out on the slopes, our muscles were sore, we were tired. We could not wait to sink into the hot water when the skiing was done for the day. I have never enjoyed an Onsen as much as I did in Niseko. This entry was posted in Japan and tagged food, Niseko, okonomiyaki, Public bath on October 17, 2016 by Traveltorgeir. It was going fast, I had to use all my energi too keep in control. To control the speed, the direction. Falling would not be too bad, I was riding through a meter of powder snow, I was more concerned about hitting a tree. I kept turning, riding through the snow. This entry was posted in Japan and tagged nature, Niseko, skiing on October 13, 2016 by Traveltorgeir. It was already almost 1pm, if we wanted to get some skiing done we had to get ready quickly. 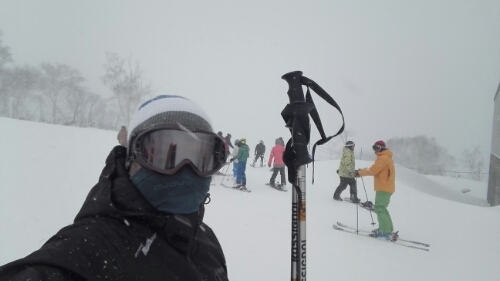 The people we were meeting in Niseko were already on the slopes, we would meet them after skiing. I needed to rent everything, all I had for this trip was long underwear. There were many places renting equipment in Niseko I had been told. This entry was posted in Japan and tagged Countryside, Niseko, skiing on October 10, 2016 by Traveltorgeir. I was so tired on the bus ride to Niseko, I slept the almost three hours drive, the whole way. Luckily my friend slept as well, I would have felt bad if I slept and she had to be awake alone. As we approached Niseko I started waking up. This entry was posted in Japan and tagged Niseko, skiing on October 6, 2016 by Traveltorgeir. In December 2016 I travelled to Japan, to spend Christmas and New Year’s there. The trip would not have been as good as it became had it not been for my visit to Fuji Rock Festival in July 2015. Because of that trip, my visit to Japan became amazing. I just made my flight back to Tokyo, the bus to New Chitose Airport in Sapporo had been delayed, as I arrived at the airport I only had minutes before check-in closed. I ran through the airport, made it just in time. This entry was posted in Japan and tagged Festival, Niseko, solo travel, travel on October 3, 2016 by Traveltorgeir.